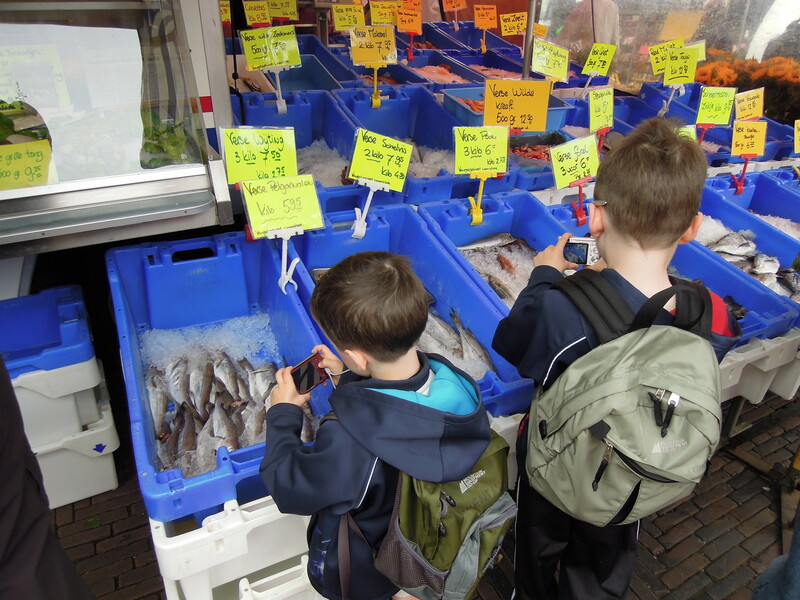 We purchased a digital camera for Quentin yesterday on the way to Haarlem as an early birthday present. This may seem a bit much for a four year old boy, but decent digital cameras are becoming less expensive every year (we paid 75 euros) and they are a great travel tool especially for young kids. Landon has one too…he inherited our old Sony camera after we upgraded to the faster, more sensitive Nikon P300. Instead of passively wandering through the markets and churches of Haarlem complaining about being tired or bored or hungry, Landon and Quentin actively engaged in searching for things to photograph. The the market in the central square in Haarlem (which runs every Saturday) was a great place to wander. We bought some nice sausage (wild boar), bread, and olives. The boys happily tagged along, photographing fish and flowers. We also entered the prominent church on the square, hoping to catch a concert featuring their famous organ (which is the largest in the world). For what ever reason, we had our dates and times mixed up once again! However, it was starting to rain outside and we felt that we might as well have a look. Luckily, the organ was being played as we entered and so we were treated to a short, impressive little concert anyway! 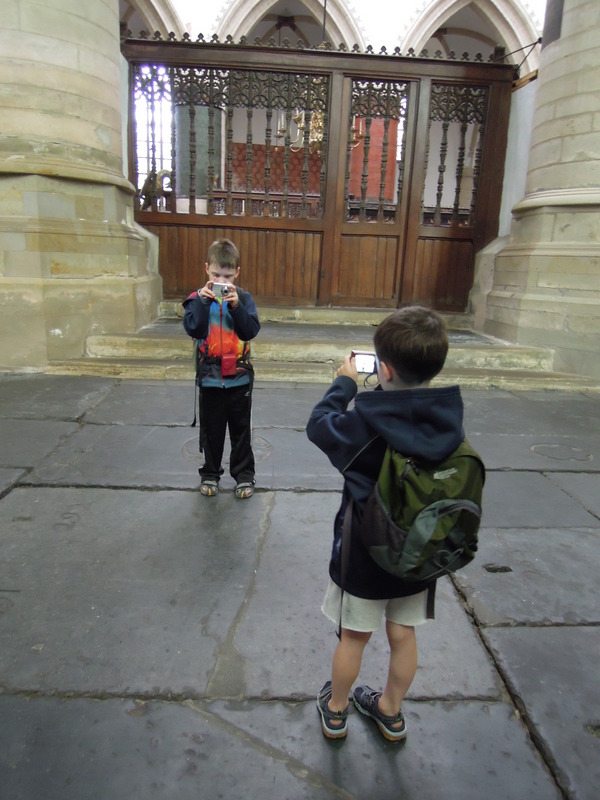 Again, the boys happily wandered around snapping photographs of anything that caught their interest. Quentin declared that this trip is really getting to be awesome now! 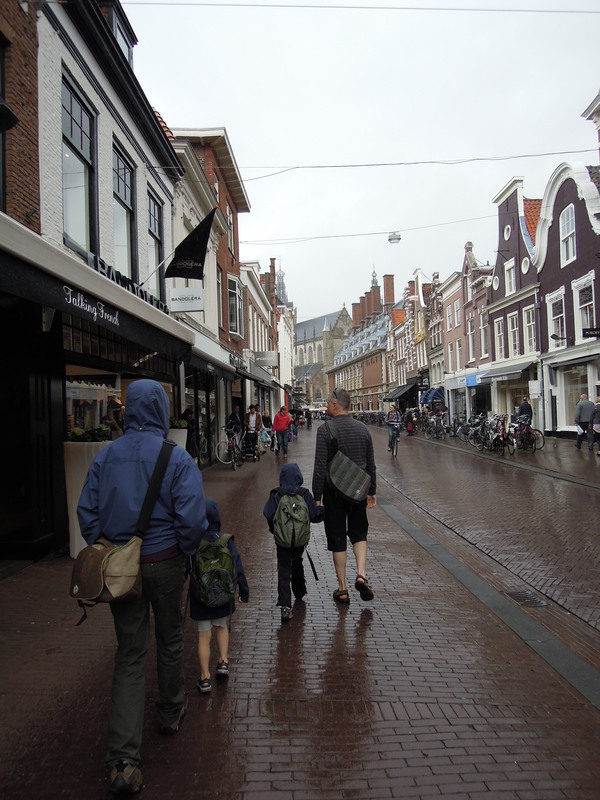 The wind and rain started to come down more seriously near the end of our Haarlem visit, so I was also treated to a glowing sense of satisfaction. I was dry and comfortable, although Steve knows (after having read my last entry) that I was hoping for a chance to gloat over my superior packing skills and so was giving me a hard time. I never said a word! We ended the day with a nice birthday dinner (it is Jelena’s birthday today). Dave and Jelena’s friend Rohan treated us to home made butter chicken (his mother’s own recipe), Jelena made fish and potato salad, and Jelena’s friend Anna brought squishy, chocolatey brownies (I ate far too many). My contribution was “expertly” cutting up the chicken for Rohan…it took me a while, but I am at least aware that there is a logic to it. It is something I haven’t done too often. Anyway, I’m hoping to have evenings like this at home once Dave and Jelena move to BC. Only trouble: we went to bed after 2:00 am and didn’t get up until 10:30. Dave and Stephen-over glasses of Tokaj and Rakia-kept cooking up plans for revenge against Amazon for messing up a gift certificate we gave to Jelena. The scheming ended when Amazon promptly agreed to rectify the problem. It was fun while it lasted, however.